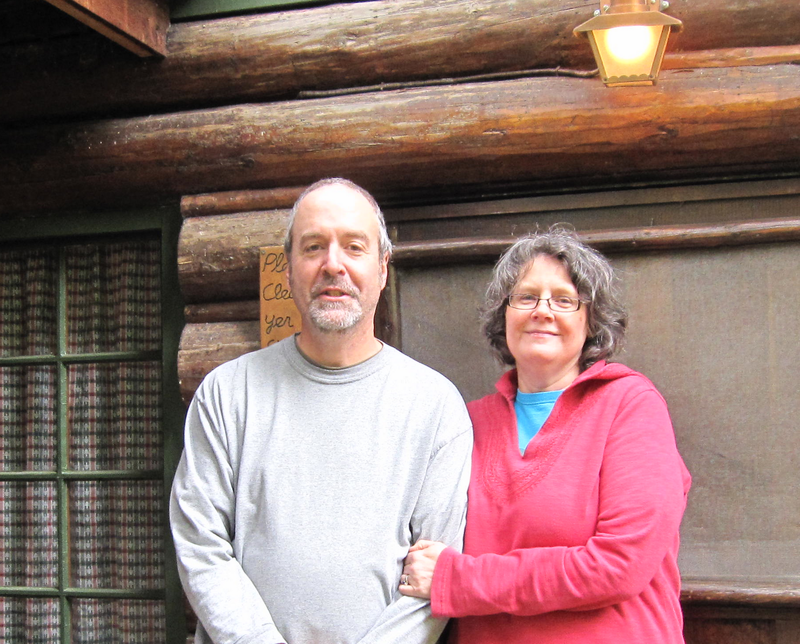 We spent the long weekend in a beautiful Steiner log cabin in Welches, OR. During the 1930s and 40s, Henry Steiner and his son John built between 80 and 100 of these amazing log cabins on the slopes of Mt. Hood, using only hand tools. Before we get to the plants, here are just a few pictures illustrating their unique vernacular style. All the interior logs had acquired the patina of time. Every element was hand-built, including the half-log stairs. Even the rustic kitchen seemed ideal, with its horn handles and open shelving. It was a perfect weekend with dear friends. On the way home, we stopped to see the gardens at McMenamin's Edgefield. I was out there this past summer for the Cracked Pots event, but it can be hard to really appreciate the gardens when the property is filled with booths, tents and crowds. In contrast, although the hotel and restaurants were clearly doing some business, it was pleasantly uncrowded on this spring Monday. I was stunned by the color in the first plant group I spotted against a south-facing wall. Fremontodendron, Ceanothus and Cotinus were underplanted with what I think could be Lonicera nitida. 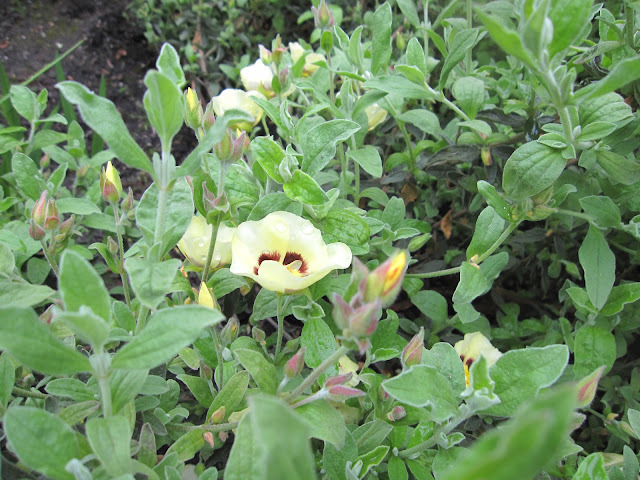 Fremontodendron has the most wonderful variation in color as it blooms, from bronzy-orange buds, through gold, to bright yellow open flowers. Close by, Melianthus major was blooming! I had no idea they had these super-cool flower heads. 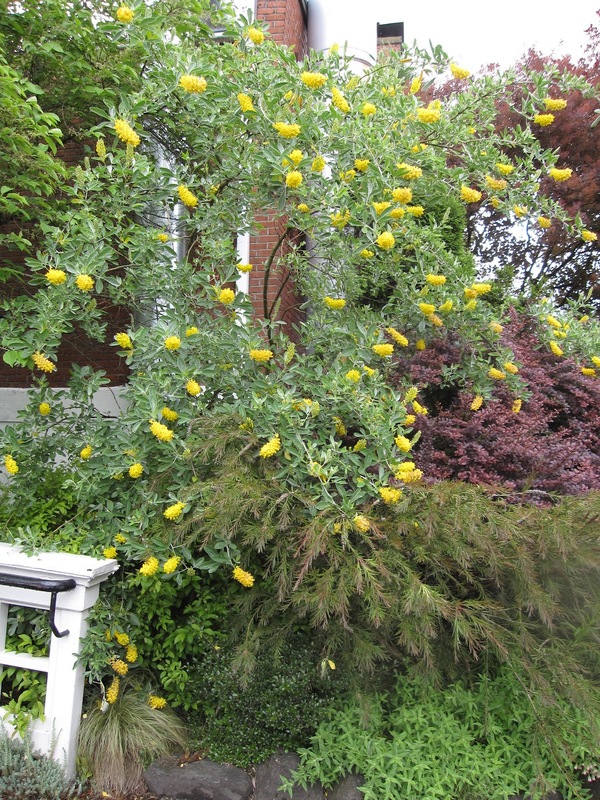 Another lovely shrub in bright yellow bloom over a dark barberry. Another view, with a Callistemon at it's feet. 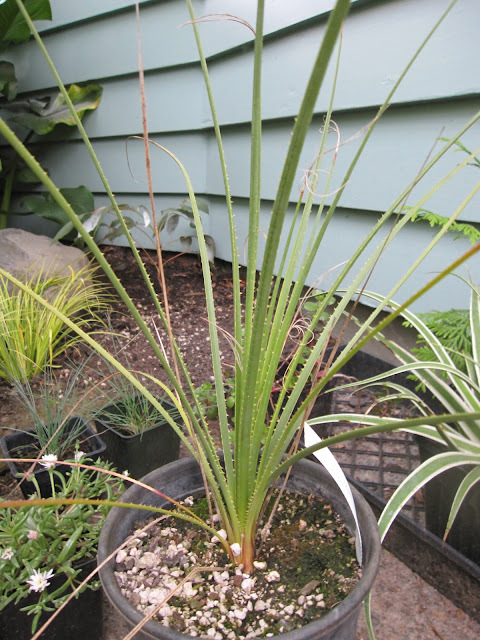 Aeoneums flourished in a terra cotta pot. Could they have been here all winter? ...and back out again, probably to the gardeners' frustration. An artichoke in the perfect pot. 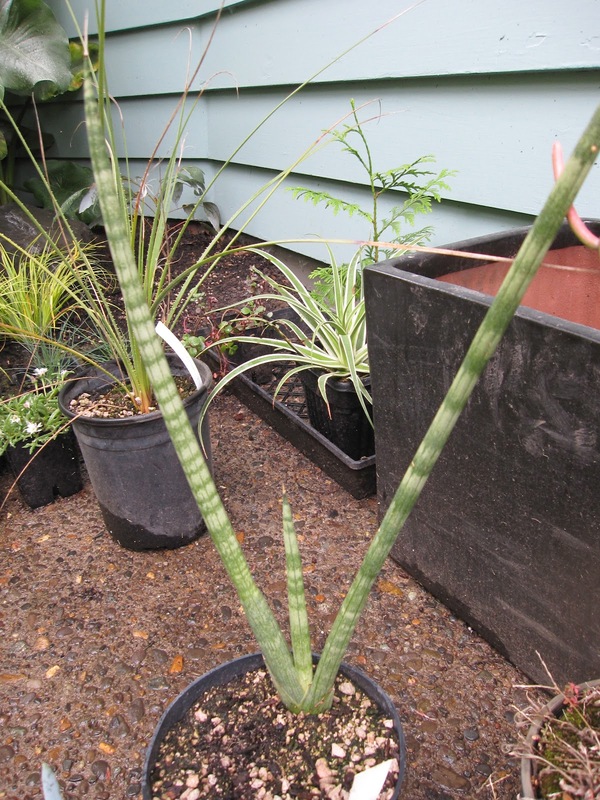 Hesperaloes and succulents in concrete drain pipes. A sleeping bee on a Calendula flower. Mullein. One day I'll grow some of these stately flowers. These looked like Melianthus major seedlings sitting in the sun outside the greenhouse. The dry garden troughs were full of Lewisias in bloom. A tiny Dianthus accompanied the Lewisias. We speculated on the origins of these huge troughs...were they the former foundations of small buildings? On our way up to the vegetable garden we passed another huge Ceanothus. The entrance to the veggie garden - typical of McMenamins' whimsy. Cold frames were full of lettuces. It was early in the season for most of the veggies. 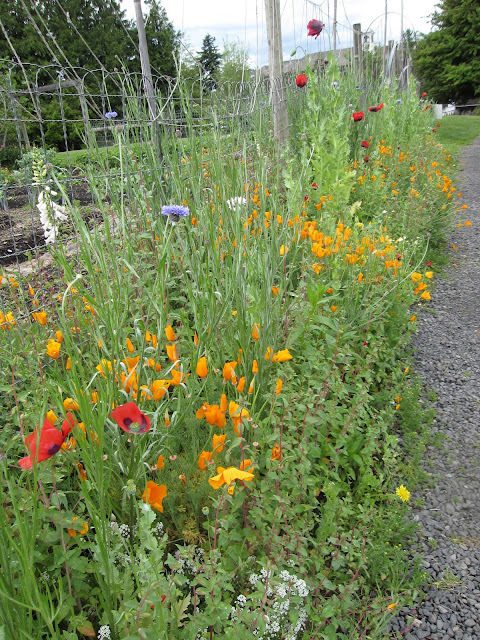 As we walked back down to the car we enjoyed the wildflower mixture that had been sown outside the vegetable garden fence. 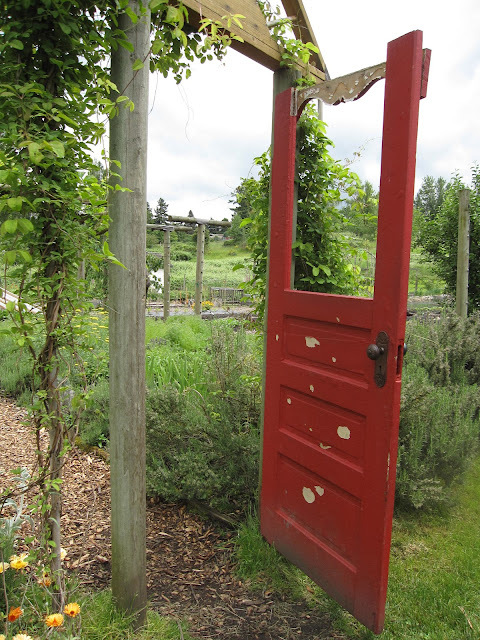 Our tour of Edgefield's gardens was a delightful end to a perfect holiday weekend. 1) My Ceanothus 'Victoria' in full bloom. It's a deeper blue than I seem able to capture. 2) Bees vibrating over said Ceanothus. 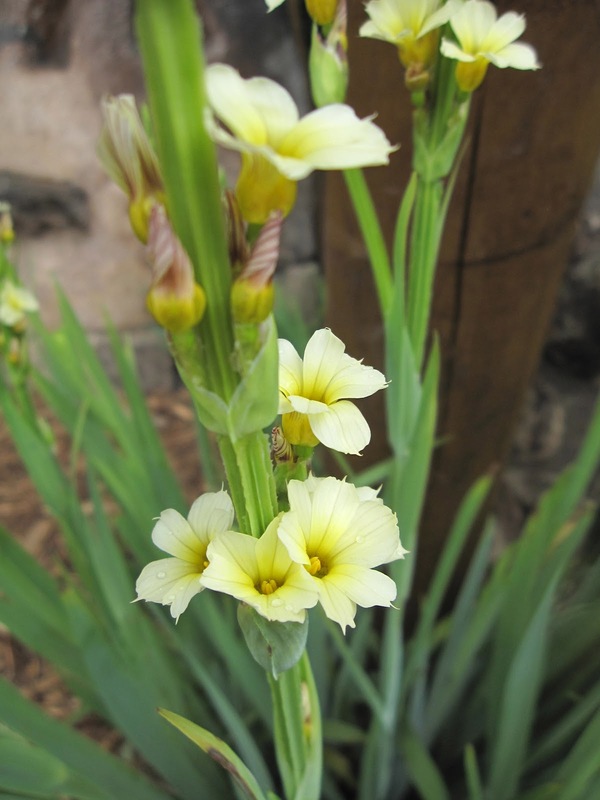 3) Flowers on Halmiocistus wintonensis 'Merrist Wood Cream'. 4) Agave parryii var truncata is making a pup! 5) Tiny Geranium subcaulescens blooming in a trough. 6) Melianthus major 'Purple Haze' making a summer comeback. 7) Another trough with Lewisia rediviva and a tiny dianthus NOID. 8) Ensete ventricosum 'Maurelii' emerging from last year's stump. 9) The jungle-y look of bamboo with Tetrapanax, both celebrating their second spring. 10) An unnamed orchid re-blooming for the third time. 11) End of the day out in the garden, while the Mulch Man barbeques our dinner. And I see I've gone over my 10 items. I'll have to get in the regular checkout lane for my next post. *A great little 2006 indie comedy, starring Morgan Freeman and Paz Vega. 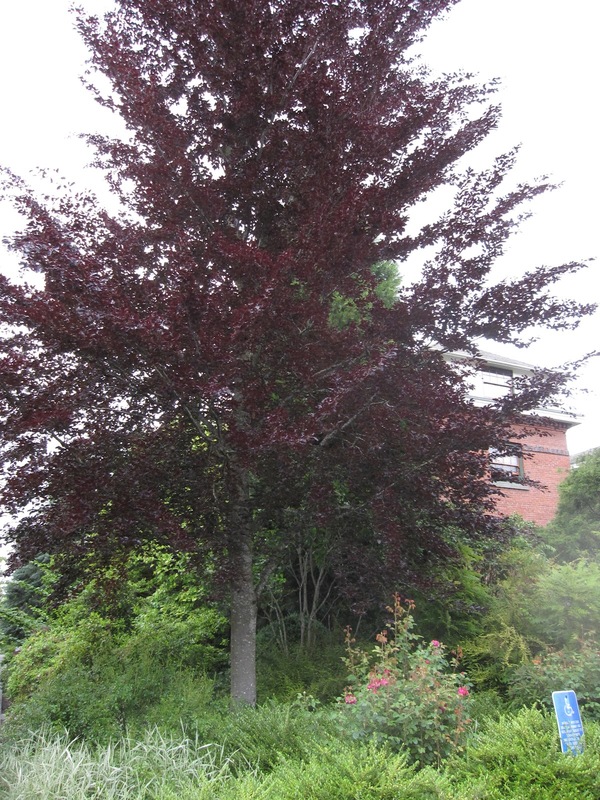 Rare Plant Research is a local nursery based in Oregon City. Although they are wholesale only, once a year they have an Open House when almost all their wares are available for purchase. This was my first visit and I loved the unique nature of the plants and the grounds. Waves of Lewisia greeted attendees. These are L. cotyledon, L. columbiana, and a third type I didn't identify. 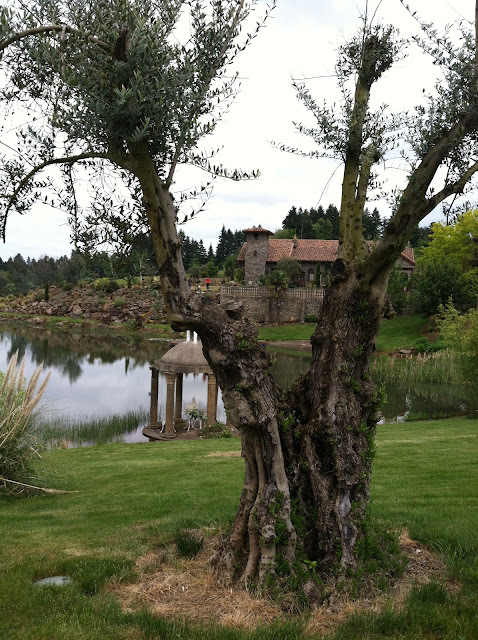 The exterior grounds and gardens of the owners' amazing Tuscan villa are also part of the open house, and well worth the visit, even if (perish the thought) you aren't into buying plants. Old olives lend an established feel to what I understand is a relatively newer garden. Small seating areas were everywhere. Some of the available plants have their larger counterparts in the gardens. Now this is how roses should be done: winding gently over and through what looks like a centuries-old stone balustrade overlooking a pond. When hot sun arrives this summer, I'd like to be sipping a glass of wine on this shady west-side portico. 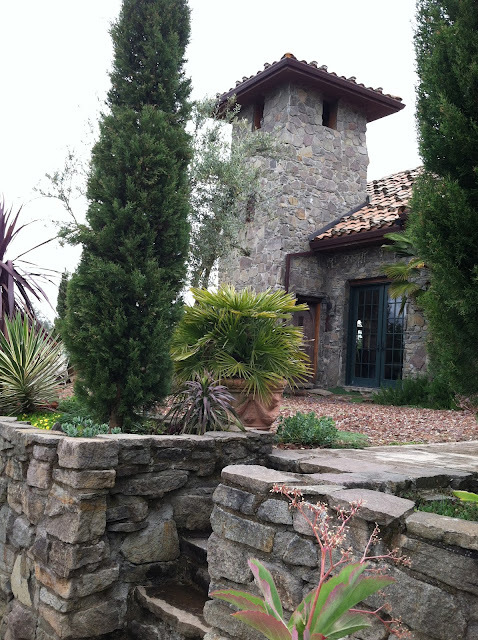 Love the Italian cypress accents. As you might imagine from their name, most of the plants grown and sold here are not your usual Pacific Northwest nursery offerings. Many of them push our local Zone 8, and at least half seemed to be Zone 9 and and 10. This makes them good summer and house plant candidates. One greenhouse had lots of big inspirational-but-not-for-sale plants, including bougainvilla! 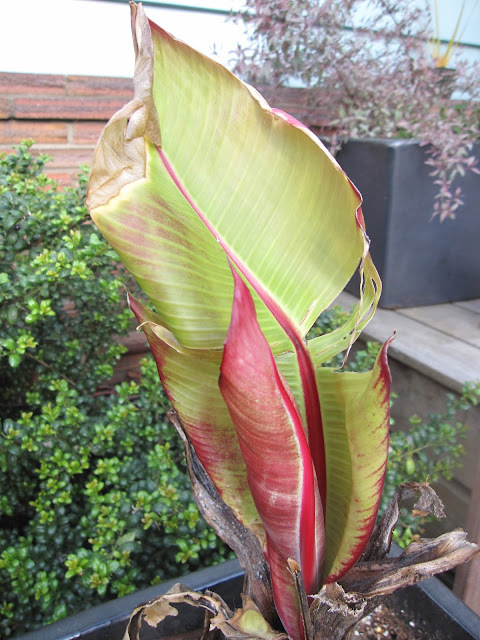 For more on what was for sale, check out danger garden where Loree has posted wonderful photos of the greenhouse interiors and their resident plants. Since I'm willing to bring some plants in for winter, but I don't have a green house, I confined myself to more modestly-sized purchases. Below, Sansevieria cylindrica, a houseplant I've wanted for some years now. I picked up Dasylirion texanum. It's hardier than the rest of my selections, so now to find a nice hot spot in the garden for it. Two little Senecio mandraliscae for the summer garden. I'll take cuttings of these Blue Chalk Sticks later in the season and winter them over for next summer. Senecio rowleyanus, known as String-of-Pearls, for an indoor hanging planter. And my splurge: a gallon-sized Euphorbia tirucalli 'Sticks on Fire'. 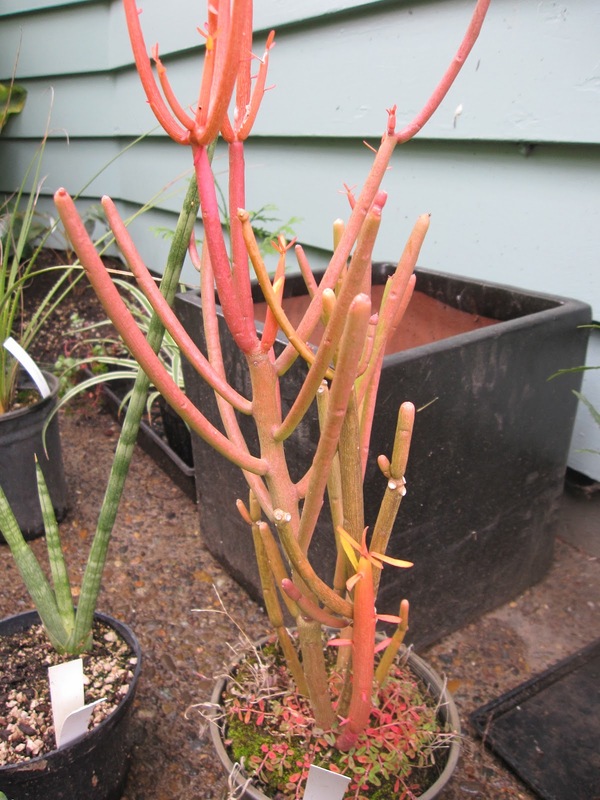 This Euphorbia is another tender plant for us, hardy only to Zone 11, but I look forward to it warming up my indoors beautifully this winter.